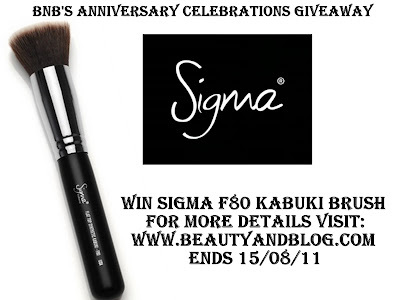 So to give you another reason to love Beauty And The Blog more and to continue the anniversary celebrations here's another giveaway for you to participate in.When I joined the Sigma affiliate program, they generously offered to host a Sigma F80 giveaway.For some reason I never got around to it.And now is the perfect opportunity. Anyhoo coming to the giveaway, I decided to try out another ingenious giveaway software Rafflecopter this time around(for the baggy giveaway I tried punchtab).And so far I'm loving it.Creating and hosting a giveaway is a piece of cake with this baby.While punchtab is great , it does not support customization of giveaway entries.And that is where Rafflecopter scores.Currently though it's still in it's beta phase so if something smells fishy do let me know.This giveaway is more or less a test run to see how it fares(because I have more awesome giveaways coming soon). The rules are simple and mentioned below.Any doubts feel free to comment. Had to pick another winner since Tani Joy did not respond to the notification mail.Shivani Sud Thakur is the new winner.Congratulations. have entered !!! hope its correct!! @Joan:Rafflecopter has made hosting giveaways really easy.I got your FB name don't worry. Yay done all the entries...I so wanna win this!! !